Hello, happy Thursday, and welcome to another Crazy4Cocoa & Friends challenge! This week we're challenging you to make a Christmas card and use some non-traditional colors! I went way out of the Christmas color boundaries for this card, but I think some little girl will really enjoy receiving this because it has pink on it! I'm using Rhubarb's Candy Cane digi image for my card, and he was colored with Copics. The dp is a soft mauve color with snowflakes, so I colored Rhubarb to coordinate with the paper, and added pink and brown accents. The sentiment was done with the Christmas Tags clear set. I added a mat and some satin ribbon in early espresso colors, and 3 pink buttons with bakers twine. If you want to play along with us, all you have to do is choose either a Cocoa image, or any of Cocoa's critter friends in the SNSS store and create a card with non-traditional colors! When uploading to the galleries, please tag your creations with C4C24! Sweet as pie, Carol. I love Rhubarb with the candy cane. I really like the pinks, too. 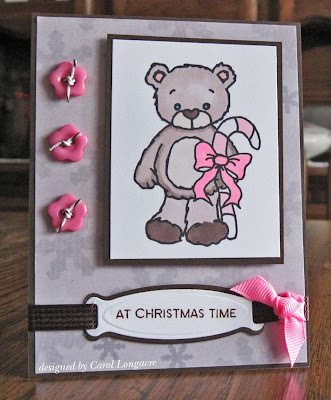 So cute, Carol and I love all the pink on Rhubarb's card. So cute!! Love the pink!